The table below shows which characteristics are more commonly associated with scholarly or popular sources. Both scholarly and popular sources can be appropriate for your research purposes, depending on your research question, but research assignments will often require you to consult primarily with scholarly materials. Grey Literature refers to "reports, conference proceedings, preprints, working papers, theses, dissertations, personal communications, technical notes" and other ephemeral scientific sources, often published by government, business or academic organizations*. This kind of literature can be key for emerging research and alternative perspectives. 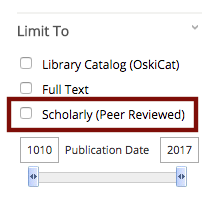 To discover the grey literature in your field of interest, browse the article databases for your subject. Government Publications are a subset of grey literature, and can be important sources for state, federal, and international perspectives on official government proceedings of all kinds. For more information on the many varieties of government documents, consult the library's Government Information guides. Tertiary Sources refer to encyclopedias, dictionaries, textbooks and other reference materials that provide broad overviews of particular topics. Where secondary sources summarize and interpret an event or phenomenon, tertiary sources summarize and interpret other resources. They can be a great place to begin studying unfamiliar topics. To find tertiary sources, take a look at the library's collection of online encyclopedias & almanacs, or dictionaries, thesauri, & quotations. ​Trade Literature refers to journals, websites, newsletters and other sources aimed at professionals in a particular field. These sources will often report news and trends in the field, reviews of products related to the industry at hand, interviews with leaders in the field, as well as job listings and advertisements. To discover the trade literature in your field of interest, take a look at the business database finder or the library research subject guide for your field of interest. See also: Engineering Trade Publications, Healthcare Industry Information. * Quote from "Grey Literature," in the Encyclopedia of Library and Information Sciences, 3rd Ed. A peer reviewed or peer refereed journal or article is one in which a group of widely acknowledged experts in a field reviews the content for scholarly soundness and academic value.